You've heard the saying "none of us is as smart as all of us", and you've felt the pressure. A group of individuals working together as a team can do better work, reach better decisions, etc. After all, two heads are better than one. Right? Given how much I can't stand (with a passion) that idea, I almost skipped the keynote talk by James Surowiecki, author of The Wisdom of Crowds. And that would have sucked. Because what he said was amazing, and I had his perspective (mostly) wrong. He started with a few thoughts on how ants (and so many other creatures) are quite simple and stupid, but that their intelligence and complexity grows with the number of interactions between them. More ant interaction equals more sophisticated behavior. It's similar to flocking behavior, of course, where birds follow very simple rules but complex behavior emerges. And that's all great and intuitive... until you get to humans. Humans, he said, demonstrate the opposite principle: more interactions equals dumber behavior. When we come together and interact as a group seeking consensus, we lose sophistication and intelligence. Ants get smarter while we get dumber. So how does this track with the name of his book? Where I had it wrong is that his book's premise (wisdom of crowds) comes with qualifiers. 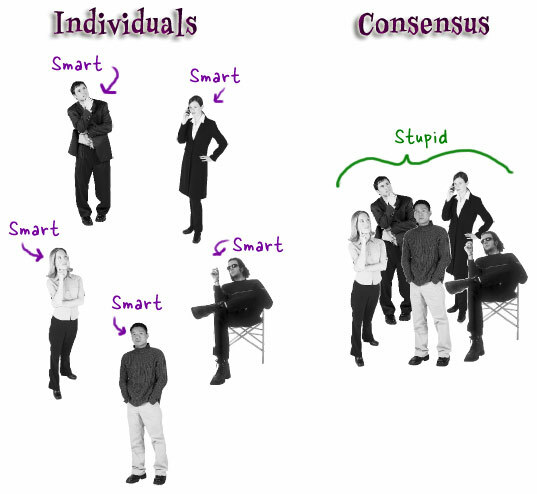 The wisdom of crowds comes not from the consensus decision of the group, but from the aggregation of the ideas/thoughts/decisions of each individual in the group. He makes other really important points including one that's related to my previous post on the lack of women at ETech--diversity increases the quality of the aggregated wisdom of the group. If you have too many people who are alike, then no matter how smart they all are, they may not come up with the same quality of answer than if you have less smart folks who have a very different point of view. Diversity brings new information. And that new information is valuable. Which leads me to... my previous post where I talked about the missing women at ETech. According to Surowiecki's formulas, the more alike the attendees of these tech conferences are, the less likely it is that you have the diverse opinions and ideas that lead to better ideas. In order for the crowd to have wisdom, the crowd has to be made up of individuals who argue! Or as he puts it in the book, "Diversity and independence are important because the best collective decisions are the product of disagreement and contest, not consensus or compromise. An intelligent group, especially when confronted with cognition problems, does not ask its members to modify their positions in order to let the group reach a decision everyone can be happy with. Instead, it figures out how to use mechanisms--like market prices, or intelligent voting systems--to aggregate and produce collective judgements that represent now what any one person in the group thinks but rather, in some sense, what they all think." "Paradoxically, the best way for a group to be smart is for each person in it to think and act as independently as possible." The last time I posted about individuals vs. teams in The Power of One, I took some heat in comments and other blogs for glorifying the person who is willing to stand up against the rest of the team. Although that wasn't my intention, I believe that group think and the overemphasis on happy productive teamwork has done more harm than good to innovation. Somewhere, there's a good balance, but right now it's too far in the favor-the-team-over-the-individual side. And this book explains exactly why and how the diversity and dissent--which are usually considered bad characteristics in a team, can (under the right circumstances--managers, don't freak out here--all disclaimers apply) lead to something much greater than what the team can do when everyone must agree. » Dos cabezas piensan mejor que una from H A L L A Z G O S ! Hmm so much for my dream to go live in a desert with no people around. I've always thought that the quote "Great minds think alike" was awfully stupid. From my general experience since school, when you put a group of people to work together, 99% of the time no work gets done - or, 99% of the people don't do any work, yet 100% gets credit (sad). Problems such as the individuals being shy to present a suggestion occur - more often than not due to the thought that "they'll think I'm stupid, so I had better not say anything". Dangerous and low productivity. Surely this is the point? In order to 'control' its workforce, most companies and CEO's don´t want 'new information'. They don´t want creative thinking. They want 'teams'. They want sameness. 'Teams' give the impression of growth. 'Teams' foster the concept of 'happiness' of 'consensus'. But in reality all successful teams have stars. Successful teams have individuals who are capable of some magic. Individuals who are capable of inserting new 'information'. Whether it be a star in a sports team or a sales person in a sales team. As a manager you learn to ignore the 'odd ball' at your peril. Conflict is good: teams that agree too easily fall into groupthink. Team members should be selected for diversity in styles of thinking and working as well as in skills and experience. More importantly, they need to know that this is deliberate and that they'd be letting the team down if they don't speak up. The role of devil's advocate: if your team tends to avoid conflict, force the issue by randomly assigning the role of devil's advocate. Make someone responsible for researching and presenting counter-arguments to the best of their ability. In some teams, this isn't an issue -- just be careful that it's not always the same person or they risk being marginalized over time. And back to the point of the post: the individual does matter. Teams with stars, all-star teams: whatever the case may be, the role of the individual in shaping a team's destiny should be highlighted. This can be done by storytelling: use Twelve Angry Men as an example of an individual standing up against groupthink or better yet, use an example from within the organization. This isn't an either/or question: you'll get superior results if your team knows that the goal is to aggregate their best ideas rather than dilute them. Think stir-fry, not soup. Regarding Kevin's comment: I've always prefered the refrain "Great minds don't think alike, they think differently." Following on to Graham's comment: most companies want 'sameness' because it's predictable. You can budget for sameness, you can schedule sameness. Those new ideas that diversity might bring... they involve a certain amount of risk. Never done those things before. Have to guess at schedule and budget. Wouldn't want that... the quarterly results have to meet the analysts' projections. I'd just like to point out that Surowiecki's observations clearly lead to the idea that a majority-rules democracy/republic may in fact inherently be a "stupid decision generator." Especially when the choices available to the voting members are essentially binary - and worse, with little difference between the two options. Compromise and consensus = poor decisions? That's what our "best government ever" is based upon. Perhaps this is exactly why it never seems to work well in the long term, eh what? This train of thought should be turned into the next evolution of human government. After you read "The Wisdom of Crowds", you might want to check out "The 7 day Weekend" by Ricardo Semler. Semler is the CEO of a HIGHLY SUCCESSFUL, but very untraditional, company in Brazil. The unique thing about his company is that it is primarily run by "consensus". More specifically, he does not "tell" people what to do, they decide what the best course of action is and then implement it. Based on his success, it appears that he is using the wisdom of the crowd extremely well (while also providing an excellent work environment... the "7 day weekend" in the title). Hopefully your reading list isn't getting too long! So glad to have you back! Another great post. I want to say I agree completely. But teamwork *is* tricky! What you're talking about is great for those times when you need to answer a question or make a decision. But what about the times when you've answered your questions and made your decisions? In these times I think it's important to hold back on the individualism. In these times it's important to obey. Question and obey. A good team needs both qualities, but at different times, in different circumstances. Striking that balance is key. Martin, I think you make great points in your post, and you're right--there needs to be a more nuanced approach, but that's why James' book is 270 pages long. I can't begin to do it justice in a small blog entry, so I hit the points that are the most meaningful to me personally. He does say that a certain amount of people learning from one another (the group interaction) DOES produce better results, but that *too much* interaction produces the "dumbing down" effect. And there are all sorts of qualifiers, conditions, subtleties that come into play as well. But the bottom line is pretty much the way I characterized it. In his talk at ETech, James started his presentation by stating that there won't be any nice tidy solution/answer to this, and that it's more about something we need to be thinking about. It's a fascinating book, if you haven't read it. There's also a short "intro" article about the method discussed in the above book I wrote at http://www.adaptiveview.com/articles/ipsoprnt.html which includes a link to an open source Java implementation. I'm curious how this idea fits in with brainstorming. I've always enjoyed the brainstorming process as it seems that a combination of ideas is usually better than any one person's solution. Having just come from a weeklong workshop where we spent a lot of time working in small groups brainstorming and combining ideas, I'd like to understand how that fits in with this idea. Is it specific to solution oriented thinking, rather than creative thinking? In our groups, we were creating stories and skits rather than a "solution". Actually he *does* talk about this -- how a certain amount of learning from one another, and brainstorming especially, DOES raise the quality of the "group wisdom", but only to a point, and then it causes a detrimental effect when it goes *past* information sharing that adds to each person's own knowledge/perspective and instead turns into too *much* influence (which in turn can lead to groupthink and too much homogeneity of thought). I'm thinkin this is very closely related to that aspect of the brain that causes it to naturally want to mimic what it perceives in other humans, and that too much smoothing over of the edges leads to... less innovation. This is not the same as less *productivity*, however. So if productivity is the goal, and innovation and (in some cases) a greater sense of individual freedom is not necessarily the ultimate goal for some groups, then this may not be a bad thing. I think part of the point is that there are tradeoffs--and that increased group productivity and "smoothness" usually comes at the risk of innovation and... other good things : ) So like any software architectural choices, it's always about the tradeoffs. But to get back to your point, yes -- the *good* kind of interaction that actually *improves* group wisdom is exactly what you said -- the power that comes from brainstorming and learning from one another. It's only after it crosses over (tips?) into something that has a dampening effect on intelligence where there is an issue. And that's why those arguing for more divserity of thought (or at least diversity of human attendees) is so important at the technology conferences (or I would think, any place else). I have no idea, and I haven't finished the book yet, although I think his point at ETech is that there's no easy answer. I can say from my work with you guys, that every interaction/brainstorming we've had has only been a benefit. When it comes to brainstorming with people who have different ideas, it's certainly been the case that four heads have been better than two. But we all have had the lead on our own projects, rather than trying to do big group *decisions*. If you'd designed the HF Design Patterns book by committee, for example, it would have suffered. Some of the most inspired things you came up with were the result of someone's breakthrough idea, not a consensus. For Bert and I, the most important job was to offer input and learning, but stay out of your way! I can't wait to hear more about your week at Esalen -- please please blog about it!! Can I survive in this world by myself? Doing all the things myself? I can cook but I am sure I cannot fly a plane. So, do we have choice but to be a part of a team? Consensus? I think most time team fails is not so much of we become stupid when we are part of the team, more so the leader does not know to lead. My observations with management is often time the selection of the team members is not so much of who can contribute what (division of labour), but who can get out from whom with what. Therefore some would get more even when it is not their expertise, and others get less because this person might not be a good in playing politic?? Why ants work better than us is because each of them know exactly their expertise, their role, their expectation in thier function towards the team. Human play games. Look at some of the fast-climbers of corporate ladder. Are they really fit for the jobs? OR is it because they are obedient to the boss? and other ulterior motives? Furthermore the energy of the team changes over time. Meaning once the expertise of the person 'is used', this person is no longer of value to the team (I finally understand it !! ), therefore keeping this person onboard would seem either under-utilized the person, or the person feels useless. And that is when we think we become stupid. Just like cooking, the leader SHOULD knows the potency of the ingredients, when to use it, how to mix it, how to cross-pollinated it ... But we are all human, influence by our emotions. Well I would like to know how Kennedy could have worked his way through the Cuban Missile Crisis without seeking consensus solutions from his 'team', discarding the dangerous proposals, and seeking agreement on the final course. Some kind of new age 'voting' proposal would not have developed the solution, nor would Bobby have been prompted to propose ignoring the first Kruschev letter. Time pressure forced a solution, luckily for us the solution worked. And how would voting help decide a polarising issue such as whether to go to war? How could an 'average' answer be better than a concensus reached after thorough discussion? Assuming we could reach one of course. We either go to war or we don't, there's no sensible 'average' here. In my post "On blogs and Boolean logic" I'm proposing a mechanism that would allow all bloggers to individually aggregate their decisions on the quality of the blogs they link so produce a much better blogosphere. "... Instead, it figures out how to use mechanisms--like market prices, or intelligent voting systems--to aggregate and produce collective judgements that represent now what any one person in the group thinks but rather, in some sense, what they all think." I suspect that you mean "... that represent *not* what any one person ..."
I didn't read all of the comments, so I apologise if I'm repeating what someone else has already pointed out. While I agree with the original post and most of the comments in the context of a business team, there are other contexts where too much individualism can be a destructive force. I'm thinking of how many societies, notably the Japanese, often value community and consensus over individuality, and this has created a very safe society. It's not perfect, but you don't have to worry about getting home safe every night. I agree, in order to innovate and come up with the next best alternative, solution or new idea, you need to be able to reflect and develop your ideas independently and bring them forward to brainstorm with a group. Otherwise, if you work together without any independent thought, you will find that many will allow others to lead them into a consensus that may not really be what they would would do. It also helps to have strong, diverse participants since they will provide an outlook others may not have thought about. I really found this article to be very entertaining and never quite looked at this from that perspective. In another vein, I recently had an experience with an effect just the opposite of the above, where I experienced the "one who knows it all" and everyone else is stupid situation. Most recently I was redeveloping a web site for a non-profit group that I am a member of. A few years back the group asked me to take on their web site and help them out, and as a kind guesture I said sure. Most recently however I began working on a new version of the site - different layout, new features a more improved lite-CMS backend and during this time a women with database experience joined our group. So as I was collecting ideas for the new web site and asked for member feedback I should have realized immmediately the headache that would bring. This woman calls me up and has me on the phone for two hours complaining about the current web site (not new specifications mind you - most of which I have no control over since the group does not contribute to the site to keep it current) and gives me nothing new for the new web site. At meetings we have when the subject or something along the lines of the web site comes up, more complaints. To make a long story short she goes on to present at one of the later meetings her database work most of which is flat (1st normal form) for a membership database she did, and despite comments from the group (constructive mostly) she has to reinforce the "excellence of the work" because, after all, her sister who is a database guru herself validated her work. She finds validation as well in critcising my work, because she did a web site herself you see. Of course when I looked at the site, it reminded me of the early beginnings of the web - a frameset, with one html page for each topic and the home page of course was a real classic - A navigation column on the left and on the right a picture with a school of fish. No intro, no company label, no nothing. Of course the implication here is that because she so technically superior to everyone, no one can do the job as well as she when it comes to technology. In closing I'd love to see some blogs on this topic. I've bookmarked your site because I find it very enjoyable to read and have passed along the link to other developer friends of mine. Nice Job. as a dance teacher and choreographer, i know this to be absolutely true. sometimes the pieces i direct turn out to be better than the ones i choreograph.